Mention Carmel to someone who’s been there and you’re likely to hear a dreamy sigh. I couldn’t really understand the appeal…until I arrived. There’s not a whole big bunch of stuff to do in this Central California coastal town. That’s the point. Carmel is about connection with nature and community. And, as I discovered, it’s an ideal place to reconnect with someone you love during a romantic getaway. Carmel by the Sea is a 1-square-mile portion of the larger area of Carmel; a village within the city. Your revved up, go-go-go speed will slow down to a leisurely stroll here. Carmel by the Sea’s charm is closely guarded by residents who want to preserve its small town-ness. There are no neon signs and very few hotels or chain restaurants (sorry, Starbucks lovers!). You won’t even find any addresses. Nope, Carmel by the Sea prefers to keep FedEx carriers guessing rather than mar the town’s charming aesthetics with anything so ugly as street numbers. There are no mail boxes either; residents walk into town to gather up their letters and deliveries from the post office so they can actually interact with their neighbors. European architecture, elaborate window displays and blooming plants make wandering through the town pleasant, even for non-shoppers (like my husband). 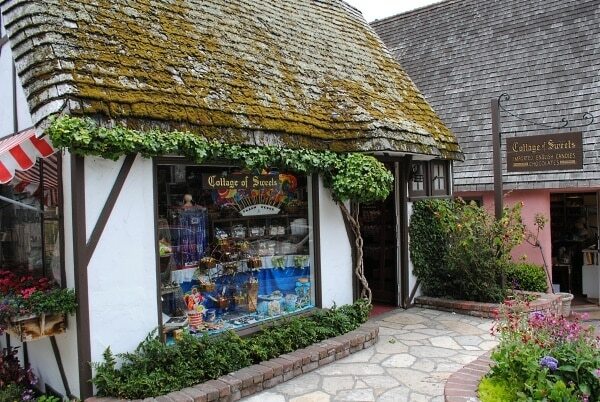 Carmel by the Sea’s shops and galleries focus on art, upscale fashions, and quirky finds. Do you like Alice in Wonderland? Then this must be your un-birthday! 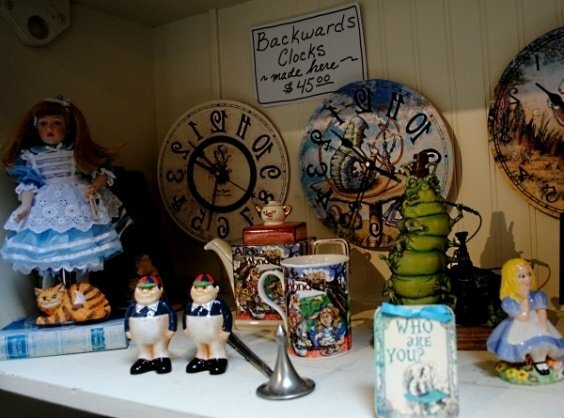 Local shop, The White Rabbit, specializes in all things Alice, including clocks that run backwards. 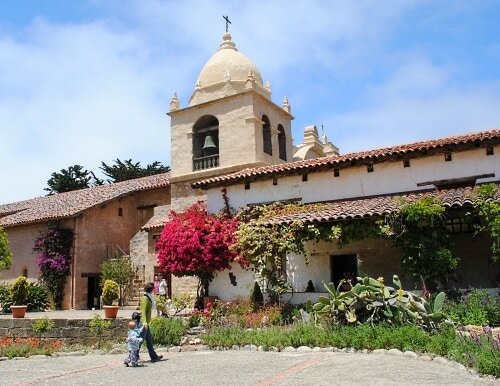 A short drive away from the center of Carmel by the Sea lies Mission San Carlos Borroméo del río Carmelo, better known as the Carmel Mission. One of 21 California missions, this is a peaceful retreat at which to stop and smell the many flowers and learn a bit of state history in the process. An active parish and school, we visited the Carmel Mission on Sunday and were treated to bells ringing, ringing, ringing to call church-goers to worship. 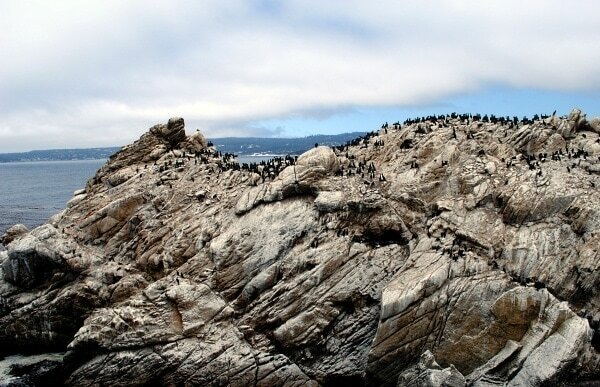 About 13 minutes from Carmel by the Sea lies Point Lobos State Reserve. 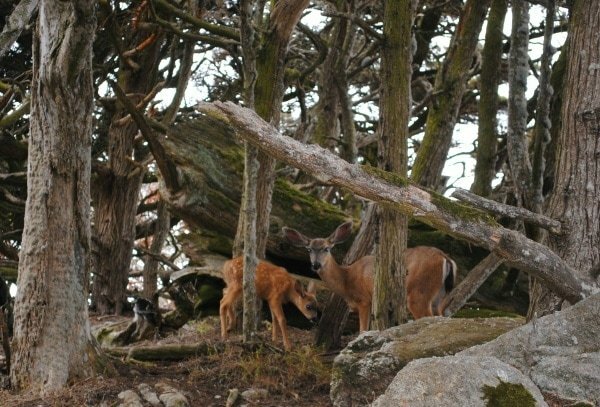 If wandering through the quaint downtown didn’t mellow you out, Point Lobos should do the trick. This reserve smells of things growing and dying and sounds of waves crashing, birds squawking or singing, seals and sea lions barking. It feels alive and reminds you that you are alive. 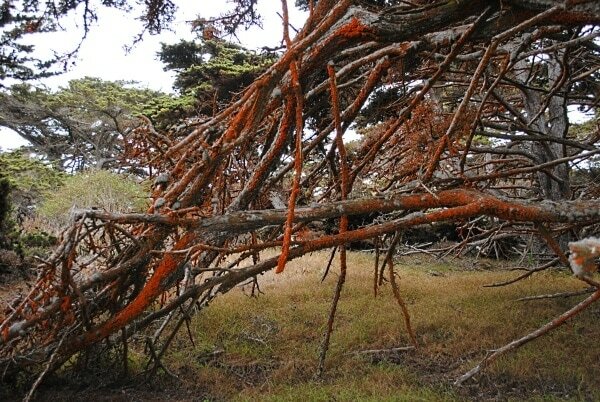 A fellow hiker we met on one of the reserve’s numerous trails told us Point Lobos reminded her of the movie “Avatar.” Indeed this sanctuary of nature does feel otherworldly with its red moss-covered twisted trees, flower festooned boulders, and wealth of animals. We spied sea lions lazing on a beach, hundreds (if not thousands) of birds, and a rather unshy mama doe and her fawn. Lucky visitors can often spy sea otters here too, but we were not among them. To get a better view of the area’s animal residents, bring binoculars or give your car keys to the information center to borrow a pair. Restaurants vary from homey to upscale, but California casual attire is de rigueur. Space is scarce in Carmel so be prepared to get cozy with your fellow diners. Choose Spanish tapas served in Mundaka‘s creative space with foreign films (silently) projected on a wall. 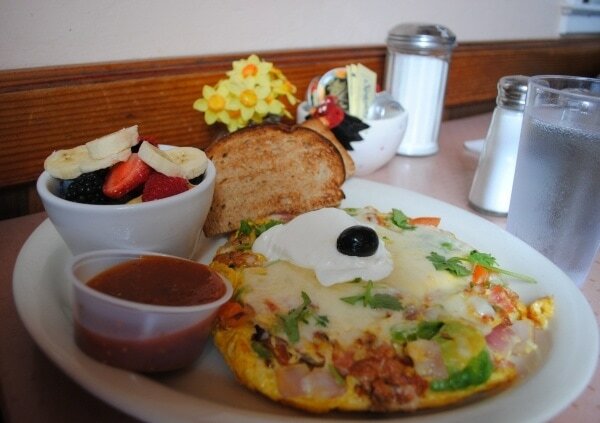 For breakfast, you can’t beat Katy’s Place with its huge plates of made-from-scratch comfort food including 16 varieties of eggs benedict. PortaBella with its darling garden setting makes a lovely spot for lunch or dinner; although my Warm Chicken Salad with nectarines and walnuts sounded promising, I was more taken with their Roasted Corn and Crab Bisque. 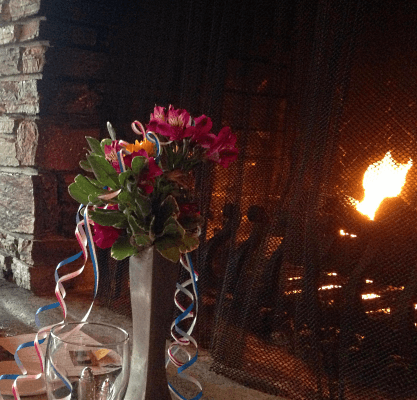 For a romantic fireside meal, Fandango is worth the short drive from Carmel by the Sea to Pacific Grove to dine on dishes like their signature Osso Buco or local sauteed Sand Dabs. I highly recommend the Petite Filet Mignon (served with green peppercorn and cognac sauce) and Scampi! To get the most out of your romantic getaway to Carmel, I recommend staying at least four nights in the area. 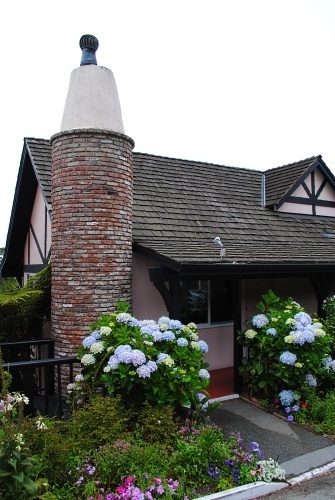 Start off with a couple of nights at the pink, Bavarian-themed Hofsas House Hotel in Carmel by the Sea, easily within walking distance of the village-like downtown. Take a dip in the inn’s heated swimming pool, or if the weather allows, make your way down to the nearby beach for swimming or nighttime s’mores by the sea. Spend a bit more for an in-room fireplace; we visited in summer and made use of ours every day. Spend your last two nights at the luxurious, yet woodsy Hyatt Carmel Highlands, about a 12-minute drive from Carmel by the Sea. The rooms are not large, but the views sure are. Our room had two balconies, one with a view of the pool, the other of the ocean and Point Lobos State Reserve in the distance. Be sure to make dinner reservations for a splurge-worthy meal at the hotel’s Pacific’s Edge Restaurant. The knock-your-socks-off views, incredible service and impeccable cuisine will not disappoint. If this place doesn’t put you in the mood for romance, I don’t know what will. I love my husband. But we drive each other bananas during our normal lives. We bicker a lot…about whose turn it is to walk the dog…and whether to leave the butter out on the counter or store it in the fridge…and so many other little everyday annoyances, most of which have to do with managing our household or raising our two children. Sometimes I forget that I chose him, long before there were kids. When we escape for a few days without our offspring, we don’t argue. At all. Ever. About anything. We hold hands. We talk and really, really listen. We are happy to compromise to make the other person happy. 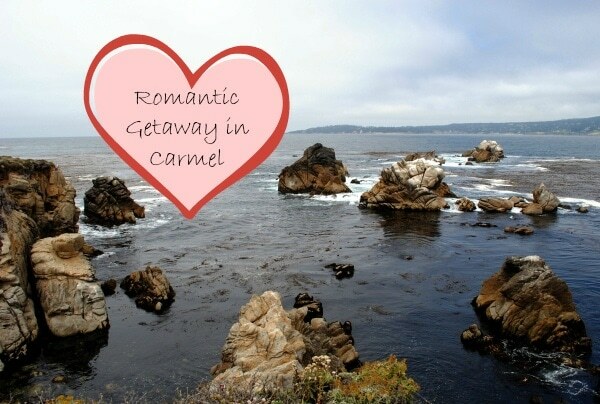 We have gone on romantic getaways in the past, but this trip to Carmel was something special. It’s such a laidback place that is so immersed in natural beauty, it would be hard to come away from here without feeling more connected. So now when someone asks me about Carmel, I’m sure I’ll sigh dreamily, remembering what it feels like to be in love. Where is your favorite romantic getaway destination? Let us know in the comments below! A Note from The Travel Mama: Thank you to Hofsas House and Hyatt Carmel Highlands for hosting a portion of our stay! 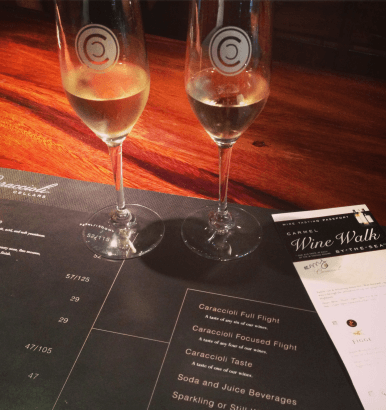 We also received some (but not all) of our meals and our Wine Walk Passport free-of-charge. All opinions are mine, as always. Sounds amazing! I’d love to check it out. Sondra – You would love Carmel – it’d be hard not to! Are you interested in the Wine Pass too?? I was very happy to read about your wonderful vacation which took place while I was having so much fun with your kids. They were fantastic. Evidently the bickering has resulted in creating kids who are an absolute joy to be around for a week. Thank you for allowing us to sneak off for a few nights. It really was a spectacular trip! Looks fabulous! I love California, and this looks like a place to add to my travel bucket list! 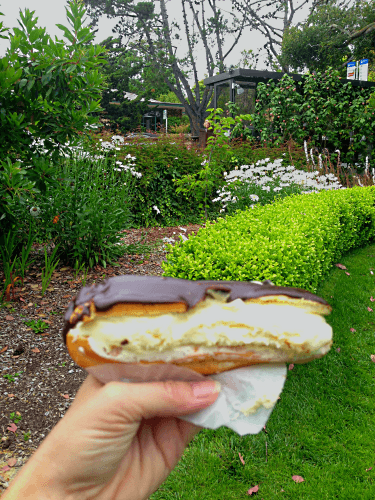 Jodi – Carmel is defintiely bucket list worthy! never heard about it before reading you post but now i added it for my next vacation spot so thank you very much for lovely pics and more lovely post. Thank you for your kind words, Smitha! You’ll love Carmel! Carmel is a great town just to walk around in. Thanks for the memories. A trip along 17 Mile Drive is worth it too. GypsyNesters – Yes, we loved the 17-Mile Drive too! I am going to include that in an upcoming post about Monterey. Thanks for the comment! what an incredibly beautiful place – wow! It’s so gorgeous, Jessie! Much like the Grand Canyon, it has to be seen to be believed—photos just can’t accurately capture it! So wonderful that you got to have such a beautiful getaway together. Looks like a lovely place to be. So lovely! I hope you get a chance to visit Carmel someday too! I have always wanted to go here! Was the water warm enough for swimming? Did you see any celebs? 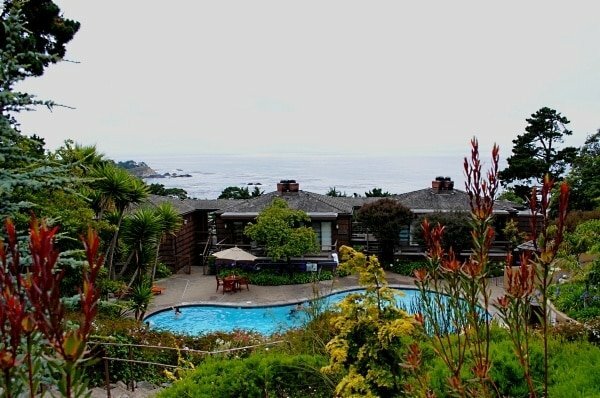 Jody – We didn’t go swimming in the ocean but there were plenty of kids swimming in Hyatt Carmel Highlands pool. With highs typically in the 60s F (about 19 Celsius), we stuck to the hot tub! Thanks for sharing these fabulous pictures and tips! Annie – Thank you for your comment. I suppose this is a natural way to feel after couples are together for a long time and dealing with young kids at home. Glad to know this resonated with you. 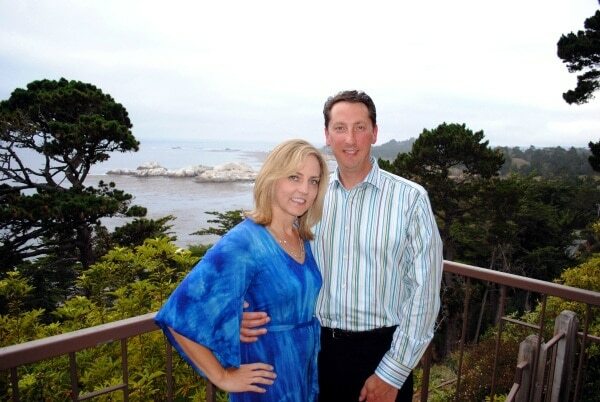 My husband and I spent our honeymoon in Pacific Grove and Carmel by the Sea almost 7 years ago! We are planning an anniversary trip there for our 7th anniversary December 9th! Next time you go there you should have dinner at Casanova Restaurant! We received a gift certificate as a wedding gift from dear friends who loved this romantic gem…. Oh my! We can’t wait to go back this year! We love the easy, relaxed atmosphere and would love the wine tour pass if no one else has asked for it yet! So glad I stumbled upon your website yesterday! Thank you for all the great ideas for this next trip! Denise – let me look for that wine tour pass. I’m sure I have it somewhere! Please email your street address to me: colleen.lanin(at)travelmamas.com. Enjoy your anniversary trip to Carmel!